Tropical wet climates are hot and muggy the year around. They support dense tropical rain forests. Rainfall is heavy and occurs in frequent showers and thunderstorms throughout the year. Average annual rainfall varies from about 70 to 100 inches (175 to 250 centimetres). Temperatures are high, and they change little during the year. The coolest month has an average temperature no lower than 64 degrees F (18 degrees C). The temperature difference between day and night is greater than the temperature difference between summer and winter. Frost and freezing temperatures do not occur. Plants grow all year. Tropical wet and dry climates occur in areas next to regions that have tropical wet climates. Temperatures in tropical wet and dry climates are similar to those in tropical wet climates, where they remain high throughout the year. The main difference between the two climates lies in their rainfall. In tropical wet and dry climates, winters are dry, and summers are wet. Generally, the length of the rainy season and the average rainfall decrease with increasing latitude. Not enough rain falls in tropical wet and dry climates to support rain forests. Instead, they support savannahs–grasslands with scattered trees. Semiarid and desert climates occur in regions with little precipitation. Desert climates are drier than semiarid climates. Semiarid climates, also called steppe climates, usually border desert climates. In both climate groups, the temperature change between day and night is considerable. One reason for the wide swings in temperature is that the skies are clear and the air is dry. Clouds would reflect much of the sun’s intense radiation during the day, slowing the rate of heating of the air near the surface. At night, clouds and water vapour would absorb much of the earth’s radiation–most of which consists of infrared rays–slowing the rate of cooling. Semiarid and desert climates occur over a greater land area than any other climate grouping. They occur in both tropical and middle latitudes. They cover broad east-west bands near 30 degrees north and south latitude. Middle latitude semiarid and desert climates are in the rain shadows of mountain ranges. Winds that descend the leeward slopes of these ranges are warm and dry. Middle latitude semiarid areas and deserts differ from their tropical counterparts mainly in their seasonal temperature changes. Winters are much colder in middle latitude semiarid areas and deserts. Subtropical dry summer climates feature warm to hot, dry summers and mild, rainy winters. These climates, sometimes called Mediterranean climates, occur on the west side of continents roughly between 30 degrees and 45 degrees latitude. The closer to the coast the area is, the more moderate the temperatures and the less the contrast between summer and winter temperatures. Humid subtropical climates are characterized by warm to hot summers and cool winters. Rainfall is distributed fairly evenly throughout the year. Winter rainfall–and sometimes snowfall–is associated with large storm systems that the westerlies steer from west to east. Most summer rainfall occurs during thunderstorms and an occasional tropical storm or hurricane. Humid subtropical climates lie on the southeast side of continents, roughly between 25 degrees and 40 degrees latitude. Humid oceanic climates are found only on the western sides of continents where prevailing winds blow from sea to land. The moderating influence of the ocean reduces the seasonal temperature contrast so that winters are cool to mild and summers are warm. Moderate precipitation occurs throughout the year. Low clouds, fog, and drizzle are common. Thunderstorms, cold waves, heat waves, and droughts are rare. 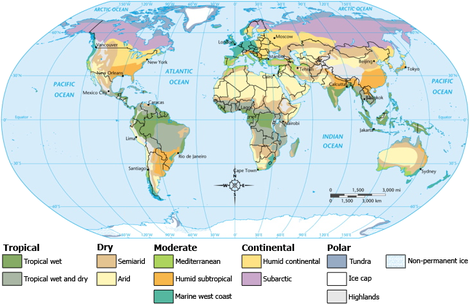 Humid continental climates feature mild to warm summers and cold winters. The temperature difference between the warmest and coldest months of the year in-creases inland. The difference is as great as 45 to 63 Fahrenheit degrees (25 to 35 Celsius degrees). Precipitation is distributed fairly evenly throughout the year, though many locations well inland have more precipitation in the summer. Snow is a major element in humid continental climates. Winter temperatures are so low that snowfall can be substantial and snow cover persistent. Snow cover has a chilling effect on climate. Snow strongly reflects solar radiation back into space, lowering daytime temperatures. Snow also efficiently sends out infrared radiation, lowering night-time temperatures. Subarctic climates have short, cool summers and long, bitterly cold winters. Freezes can occur even in midsummer. Most precipitation falls in the summer. Snow comes early in the fall and lasts on the ground into early summer. Tundra climates are dry, with a brief, chilly summer and a bitterly cold winter. Continuous permafrost (permanently frozen ground) lies under much of the treeless tundra regions. Icecap climates are the coldest on earth. Summer temperatures rarely rise above the freezing point. Temperatures are extremely low during the long, dark winter. Precipitation is meager and is almost always in the form of snow. Highland climates occur in mountainous regions. A highland climate zone is composed of several areas whose climates are like those found in flat terrain. Because air temperature decreases with increasing elevation in the mountains, each climate area is restricted to a certain range of altitude.